The Pearl “East” is located in Sunset Beach, N.C. and borders the scenic Calabash River. Renowned golf course architect, Dan Maples, carved out a beautiful parkland style golf course through pristine forest and natural terrain. This award winning Myrtle Beach golf course opened in 1986 and was completely renovated in 1999. The lush fairways wind through the towering trees and marshlands and lead to elevated greens that are surrounded by strategic bunkers. 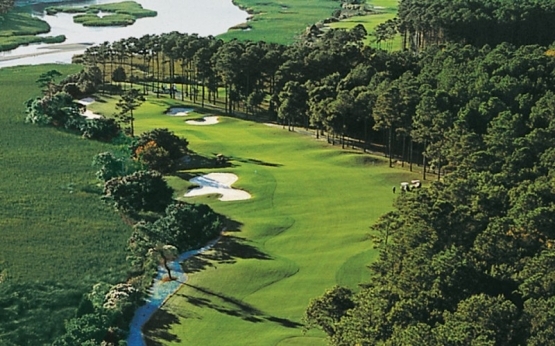 Beautiful marshland vistas and views of the scenic Calabash River offer unique Myrtle Beach golf photo opportunities. The Pearl “East” can challenge the very best players, but is very playable for all skill levels and fun for all. The Pearl has a full service clubhouse that makes it the perfect place to unwind after your round. The practice facility features a grass driving range and putting green. The Pearl in only a short drive from the outstanding North Myrtle Beach condos, hotels and ocean front beach houses. After enjoying your round at the Pearl “East” be sure to stop in the historic fishing village of Calabash, N.C. Calabash seafood is known throughout the world and you will certainly want to give it a try. Myrtle Beach golf packages offer the very best in Myrtle Beach golf deals and today would be the perfect time to book one. View a Virtual Tour of the golf course. Good layout, OK quality, greens need help. Maybe West is better.